worthy causes, through a series of annual fundraising events. 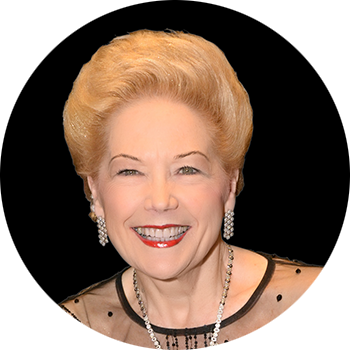 Susan Alberti AC is one of Australia’s pre-eminent philanthropists, having donated millions of dollars to medical research and other charitable causes over her successful business career. Susan developed a passion for medical research when her only child, Danielle, was diagnosed with Type 1 diabetes in the 1980s. Danielle tragically died from the complications arising from the chronic disease. It was at that point Susan’s lifelong commitment to raise funds for better prevention, treatment and to find a cure for Type 1 diabetes became a dedicated mission. This has subsequently led her to focus on medical research more broadly. Susan Alberti was a finalist in the Australian of the Year Award in 1997 and again in 2009. In 1997 she received an AM (Member of the Order of Australia) for her contributions towards the cause of diabetes research. Susan was awarded an AO (Officer of the Order of Australia) on January 2007. This recognised her long and outstanding contribution to major medical research institutions, particularly as a philanthropist, fundraiser and advocate for Type1 diabetes care and research. On Australia Day 2016, Susan was awarded the Companion of the Order of Australia (AC) Award in recognition of her eminent service to the community, particularly through philanthropic and fundraising support for a range of medical research, education and to young women as a role model and mentor. Susan is Chair of the Susan Alberti Medical Research Foundation, Retired Chair of the St Vincent’s Institute of Medical Research Foundation, Director of the Western Health Foundation, Retired Chair of the DANII Foundation, Chair of the Victoria University Foundation, Retired Vice President of the AFL Western Bulldogs Football Club, Director of the Western Bulldogs Forever Foundation, Retired President of the VFL Footscray Bulldogs, Director of the AFL National Women’s League Advisory Group, Retired Director of the National Australia Day Council. Susan is also (Alma Mater) Patron of Siena College Camberwell and Governor of the Siena Philanthropic Society in addition to holding the many honorary philanthropic positions. Susan was featured on ABC Australia Story ‘A League of Their Own’ aired on 29 August, 2016 and also on Network Seven’s Sunday Night Program in 2017. Susan is also Chair, Australia Day Committee (Victoria) for a term of two years. Susan is also the Heathcote Dementia Village fundraising campaign ambassador. Susan also received the “Person of Sporting Influence 2017” Award during the prestigious Australian Women’s Health 2017 Women in Sports Awards evening. In August 2017, Susan was appointed as part-time general member of the Australian Charities and Not-for-profits Commission (ACNC) Advisory Board for a period of three years. On October 31, 2017, Richard Goyder AO launched Susan’s biography, ‘The Footy Lady’ and on November 18, 2017 Susan was crowned 2017 Melburnian of the Year. During the 2017 AIS Sport Performance Awards held on December 12, Susan was presented with the Leadership Award for her vision and influence in driving the launch of the inaugural AFL Women’s competition. On May 9, 2018 Susan was honoured to receive the InStyle and Audi Women of Style 2018 “The Irrepressible Force” Award. On July 2, 2018 Susan was announced as the 2018 Victorian of the Year. Susan received the Victoria Day Council Award for Community and Public Service. In November 2018 was elected as a Director of Volunteering Australia. Susan was recently nominated in the “The 50 Most Influential Aussie Women in Sport” in the Herald Sun Sunday edition on January 20, 2019. On February 21, 2019 Susan was awarded the prestigious 2018 Victorian State Government Outstanding Contribution to Sport Award. We are excited to announce our 2019 Mother’s Day Luncheon.